Clare Cottage01263 715779work01603 870304fax Self-cateringClare Cottage is a wonderful detached property that not only has its own garden but also a private meadow! A charming, spacious property with a relaxed farmhouse feel it is perfect as a family holiday but also for friends to get together. This is a perfect base for exploring the countryside or heading off to the North Norfolk coast which is only 6 miles away. The market town of Holt is just 10 miles away, a haven for retail therapy full of independent boutiques, shops, cafes and galleries. 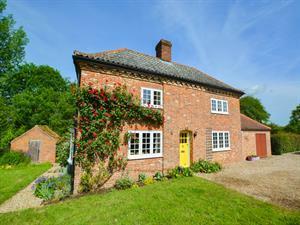 Clare Cottage is a wonderful detached property that not only has its own garden but also a private meadow! A charming, spacious property with a relaxed farmhouse feel it is perfect as a family holiday but also for friends to get together. This is a perfect base for exploring the countryside or heading off to the North Norfolk coast which is only 6 miles away. The market town of Holt is just 10 miles away, a haven for retail therapy full of independent boutiques, shops, cafes and galleries.